I am totally for the 26 weeks as the first years are the most important for our little ones….Why be forced back to work and get strees then have to bring that home with you….it not only effects our children but the whole environment. 26 Weeks for a life time of benificial moulding our future. Our children are the future of this country. What’s best for them should be priority. Definitely supporting 26 weeks – we need to give our mother’s the chance to be the first educators of our children and show them we value their role and we value our children enough to give them the best start they deserve. Just discovered that student loan repayments still get deducted when you are receiving the 14 weeks paid parental leave! Not impressed. I have remained in NZ ever since I graduated as a Registered Nurse and yet there are no real financial benefits in doing so! Not looking forward to living within a very tight budget come baby’s arrival in April. Rant over. I had no choice but to return to work when my twins were 4 months! My leave started well before they were born! Hardest thing a mother has to face! I’m due in April and hope this is passed before babies arrival! I’m a small business owner, and I know how challenging it often is for small businesses to juggle the needs of their staff, their customers and their business. I know how hard it can be to find great staff to cover parental leave, AND I support 26 weeks paid parental leave – our children need it, our new parents deserve it. I’m also a woman who has chosen not to have children AND I support 26 weeks paid parental leave, our families need it and our communites will benefit from it. I very much support the increase in paid parental leave, the current leave entitlement allows only enough time to allow the mothers body to re-adjust and recover, never mind get used to the new responsibilities of parenthood. Adding the stress of having to get back to work after a short duration off is detrimental to both the baby and the parents. I am totally agree with 26 weeks. All comments above are obviously true, I wish the next country leaders have the same vision like us. I am concerned about world population numbers – we are currently at a level beyond the carrying capacity of the planet. This sort of policy needs to have tools that don’t encourage couples to have large families. That would fly in the face of global efforts to manage population growth. Perhaps we need to set it for 2 babies only. Totally agree with 26weeks. We mothers would like to spend as much time with our new born as possible and in saying this breast feeding. We all know breast feeding is more beneficial to babies but so is money. Currently as much as we want we still have to leave our baby to join work force. Wouldn’t it be better for both baby and mother if this is granted. Our families need this….our community needs this….. I just heard about this initiative and I want to support it 100%. I recently returned to NZ from the UK and am about to have my first baby. I am very disappointed by the disconnect between the WHO recommendation to breastfeed exclusively for six months and the 3 1/2 month paid parental leave on offer in NZ. 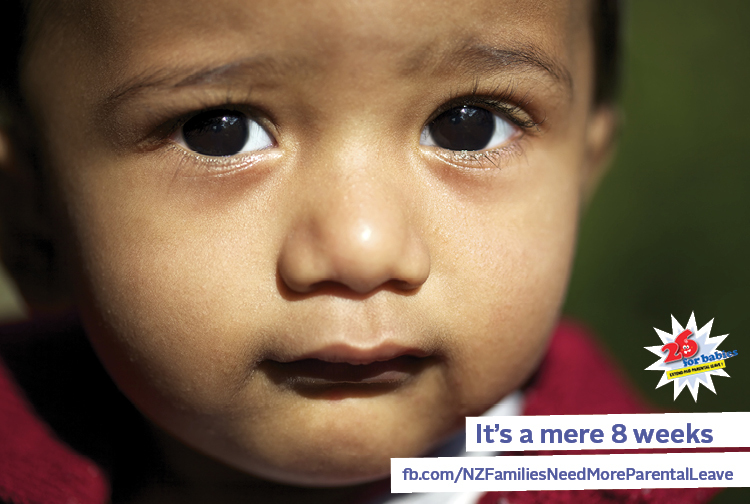 It is contradictory and damaging for the family unit here in NZ. Please pick this issue up again and tell me how I can help! Yes! I am all for 26 weeks! This time is the most important time to build the love, nature and support a baby needs for a great start of their life. The only person who can fully give it to them is there parents. Agree that this is an added pressure. I’ve heard that it is possible to negotiate your SL repayments down to 1%. I’d recommend that you contact your local IRD office to discuss. I’m all for 26 weeks! Not only should we extend it but the Govt should look at increasing the maximum limit of payments. At the moment parents are entitled to $516.85 per week, which then gets taxed! That baffles me. New Zealanders already pay for this entitlement through tax and then the Govt double dips and taxes you again. In the end what this results to is families get a pittance for doing what is the most important jobs in their lives – raising good, upstanding, and contributing members of society. We need equal time for both parents, both to strengthen our families, and to close the gender pay gap. We need to look after our children and mothers, but also our fathers.